Your students can keep it cool and enjoy some healthy fun with this enticing playground set from Kidstuff Playsystems. A functional design maximizes play so the whole class can enjoy climbing and sliding together. The hexagon-shaped platform offers excitement in every direction, with a different activity on each side. A roof over the main platform prevents it from getting too hot in the sun and keeps kids in the shade as they climb and explore. 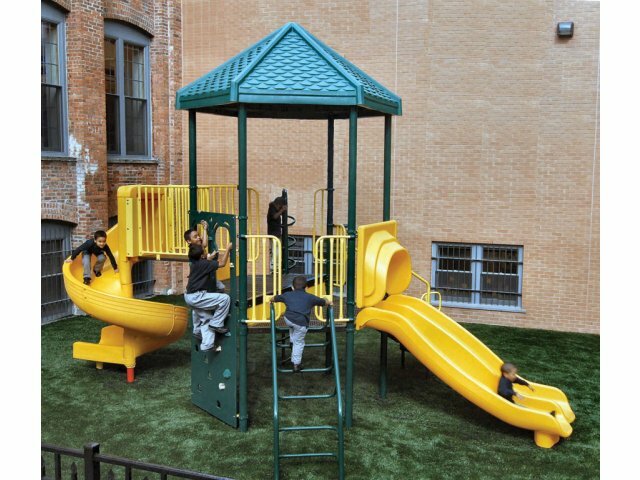 This playground set includes numerous slides and climbers as well as a double climbing wall for side-by-side fun. It is built to last with a heavy-duty punched steel platform. Get your students ready to climb up, slide down and get moving with a new playground set that will make recess better than ever. Exciting Design: Includes a Spiral Slide, a Combo Slide, a Coil Climber, an Arch Climber and a Climbing Wall. Shady Play: The hexagon-shaped roof keeps the main platform shady so the surface won't get too hot. Durable Material: The hexagon-shaped platform is fabricated from extra-heavy duty punched steel and fully welded to last a lifetime.